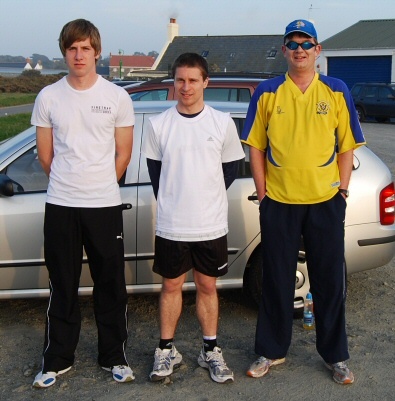 Stuart Le Noury won the Channel Island Ceramics Eric Waldron Trophy for the seventh time after losing his nearest challenger mid way through the race. Brothers Stuart and Jason Le Noury headed the field of 12 walkers from the start of the traditional 2 miles walk, first contested back in 1964. Together for 3 laps, the eventual winner pulled away to cross the line in 15.43, leaving second placed Jason over half a minute behind. Third to finish was Rob Elliott in 18.12 who soon left his nearest challenger Phil Lockwood behind. An even paced walk gave Elliott a half minute cushion over Phil, who is in training for the London Marathon being held soon. Young Alex Sinkevics overtook the elder Kevin Le Noury in the closing lap to finish in 20.43, five seconds ahead. The fastest of the women was Marie Macdonald in 22.07, a seven seconds personal best time, beating her time set last year. Jayne Le Noury took second place in 22.50, ahead of a fast finishing Kay Coulson in 23.12. Peter Beckerleg, having been overtaken by Kay late on finished in 23.15 with Dave Dorey closing in 24.06. The next walk is on Sunday April 17th at Delancey Park at 9.30 am over a distance of 10 kilometres. It is the second race in the Heritage Championships. Details from Jayne Le Noury, lenouryjedburgh@cwgsy.net. Slight change to the fixture list is the walk on Sunday May 29th . The race will now start at 9.00 am, due to walkers wishing to take part in the Race for Life being held soon after. Other details remain the same. Stuart Le Noury walked to victory in the second race of the Channel Island Ceramics sponsored classic Guernsey races when adding the Eric Waldron 2 miles trophy to his recently won Chilcott Cup. With the company of brother Jason and Rob Elliott for the first of the eight laps, he gradually pulled away to pass the half way point in 7.35, ten seconds up on his brother. Elliott was now well adrift ion 8.04. The leading woman at this point was Olga Sinkevica in 10.29, with a sixteen seconds lead over the next woman Marie Macdonald. With a slight slowing down, on a warm evening, Stuart finished in 15.19 to retain the trophy and record a new personal best time by a few seconds, followed by Jason in just under 16 minutes. Third placed Rob Elliott in 16.24 removed 13 seconds from the age best time set by Terry Bates. Olga held on to her lead as fastest woman with 20.57, with Marie in second place but dropping well back. Kay Coulson was third woman home after a spirited finish to pip male competitor Dave Dorey. Kevin Le Noury and Peter Beckerleg both walked quicker than last years event, whilst Mick Le Sauvage set a new M75 Guernsey best time. The next walk is on Sunday April 26th at 9.30 am over a distance of 10 kilometres. Venue is North Side and is the third walk in the Championship Series. Details from Jayne Le Noury, lenouryjedburgh@cwgsy.net. 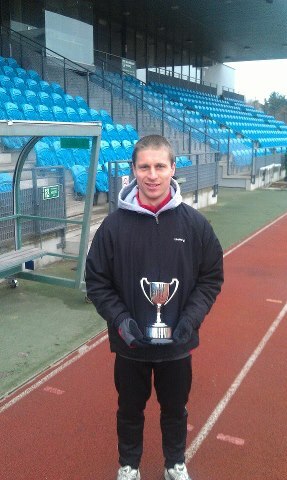 Stuart Le Noury retained the Channel Island Ceramics sponsored Eric Waldron Trophy over 2 miles with an easy win in 15.45. The trophy which was first presented in 1964 has now been won 5 times by Stuart, on this occasion being only 23 seconds outside his best winning time. Going through half way in 7.44 he slowed in the latter half. Kevin Le Noury won the race for second place ahead of Peter Beckerleg. A battle to the line saw Dave Dorey just edge ahead of Mick Le Sauvage, whilst Jayne Le Noury was the quickest woman finishing ahead of Rita Herridge and Kay Coulson. Team winners in the last club event Kay Coulson and Rob Elliott had races at the other end as Kay brought the race to a close with Rob Elliott pulling up after only half a laps walking. The next walk is on Sunday April 27th at Quayside, North Side over a distance of 10 kilometres. It will be the third race in the Heritage Club Championships starting at 9.30 am. Details from Jayne Le Noury lenouryjedburgh@cwgsy.net. The next walk in the SWC calendar is the 2 miles track walk for the Eric Waldron Trophy, being held at Footes Lane this coming Friday evening at 6.30 pm. He donated the trophy to the GIAAC 50 years ago in 1964, which in turn was passed on to the SWC in 1970. Inaugural winner of the 2 miles track (grass track at Cambridge Park) walk was Len Duquemin winning narrowly from John Moullin, both given the same time of 16.09.1. Duquemin improving his time to 14.46.5 in 1966, which until 2009 was the Guernsey Allcomers Record for a 2 miles track walk, until Carl Thomson walked 14.40.4. The event moved to the roads after that from 1969 to 2002. From 2003 the race has moved back to a track walk for most years to 2013. Len Duquemin`s track time has frequently been surpassed with winning times on the road. Walker’s fastest winning times in this race are, Rob Waterman 14.30 in 1969, Andy Le Heron 14.15 in 1972, Mick Elliott 14.33 in 1974, Rob Elliott 13.58 in 1981, Mark Elliott 13.56 in 1985, Carl Thomson 14.02 in 1990, Jason Le Noury 15.10 and Stuart Le Noury 15.22. The Sarnia Walking Club are pleased to announce that Channel Island Ceramics are to sponsor two of the oldest events on our calendar in 2014, namely the Eric Waldron 2 miles track walk and the Chilcott Cup 7 miles road walk. 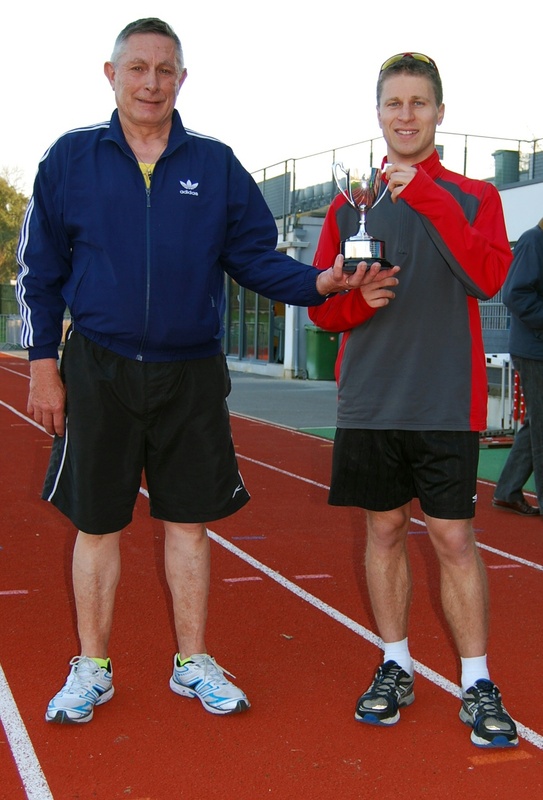 The trophies both date back to the 1960`s and were first donated to the Guernsey Island Amateur Athletic Club. They were then passed on to the Sarnia Walking Club. The Eric Waldron Trophy was introduced in 1964 and first won by Len Duquemin in 16.09.1, just ahead of John Moullin who was given the same time. The first events were held on the grass track at Cambridge Park, with Duquemin improving his time to 14.46.5 in 1966, which until 2009 was the Guernsey Allcomers Record for a 2 miles track walk, until Carl Thomson walked 14.40.4. Len Duquemin`s track time has frequently been surpassed with winning times on the road. Walker’s fastest winning times in this race are, Rob Waterman 14.30 in 1969, Andy Le Heron 14.15 in 1972, Mick Elliott 14.33 in 1974, Rob Elliott 13.58 in 1981, Mark Elliott 13.56 in 1985, Carl Thomson 14.02 in 1990. The Chilcott & Sons Ltd Trophy was first walked for in 1963 and won by T Le Gallez. John Moullin took the honours a year later just breaking the hour barrier. Roy Brouard was awarded the Trophy in 1965 in a handicapped 7 miles walk. After a gap of six years the Trophy was reintroduced, with Moullin winning in 1971 in 54.35. Rob Waterman went even quicker a year later with a 53.58 winning time. Mick Elliott won the Trophy 5 times between 1973 and 1981, a 55.19 being his fastest time. His son Robert has won the race 16 times, with a best of 51.35, which is still a Guernsey record on the Houmet to White Rock course. Carl Thomson has 6 wins to his name, with a fastest time of 51.56 on the Albecq to North Side course. Stuart Le Noury retained the Office Solutions Eric Waldron Trophy in the first evening race of the year.The bitterly cold evening and windy conditions did not help as he led from start to finish to cross the line in 16.39. Second man home and thirty seconds behind was Phil Lockwood with past winner Rob Elliott back in third. Rose Druckes was the quickest of the women ahead of Harriet Payne. Nowadays the distance is rarely competed over, but the SWC are sticking to the distance for this traditional trophy awarded almost 50 years ago by Eric Waldron. Eric, an athelete back in the 1950`s and 1960`s and occasional race walker has twice won the annual Church to Church road walk. The next walk is on Sunday April 14th at Les Amarreurs at 9.30 am. The race is a one mile handicap and is for the Philadelphia Team Trophy. Details from Jayne Le Noury at lenouryjedburgh@cwgsy.net. Stuart Le Noury retained the Office Solutions sponsored walk for the Eric Waldron Trophy when easily taking victory in a new personal best 2 miles time of 15.22 on the road at Les Amarreurs. Ideal conditions helped all the walkers in the first evening race of the year. An ankle injury probably cost Le Noury removing more time, but was good enough to leave second man home trailing by 41 seconds. Jason Le Noury was second home in his first race for some time, with Phil Lockwood taking third place. Past winner Rob Elliott had a good race finishing not too far behind Lockwood and breaking the Guernsey age group best time. Jayne Le Noury was the first woman home in 21.41, which was her best for five years. The next walk is on Sunday April 15th at 9.30 am. The walk is from Albecq to North Side, a distance of seven miles and is for the Office Solutions Chilcott Cup. All are welcome to compete. Details from Jayne Le Noury, tel 246865. Photo left to right, Jason Le Noury, Stuart Le Noury and Phil Lockwood.